Ten cantonal war flags carried in the Battle of Nancy (1477) in the depiction of the Luzerner Chronik of 1513. All flags of the Eight Cantons are shown, but the flags of Berne and Uri omit the heraldic animal, showing only the cantonal colours. In addition, the flags of Fribourg and Solothurn are shown, at the time not yet full members, who would join the confederacy in the aftermath of this battle. Each flag has the confederate cross attached. ธงชัยกองพันทหาราบสวิส ในหนังสือTagsatzung ฉบับวันนที่ 12 ตุลาคม ค.ศ. 1815, ออกแบบโดย Niklaus Franz von Bachmann. 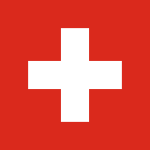 ↑ "Swiss yacht flag". flagsforum. 13 September 2010. หน้านี้แก้ไขล่าสุดเมื่อวันที่ 27 ธันวาคม 2561 เวลา 21:10 น.